Compare Showerheads with Wireless Speaker: Kohler Moxie or H2oVibe Rain? Taking a shower is something we all enjoy as it brings us a number of well known benefits. Its main purpose may be to cleanse our body, but it also makes us relax and unwind. The fact that many people like to sing while showering proves that point quite well. Well, nowadays, we can take this feeling of well being and relaxation that comes with showering even further: we can shower not just with water, but also with our favorite music streaming down the shower-head along with the water, enveloping body and soul, and filling us with euphoria. This is realized by using showerheads equipped with wireless speakers that use the Bluetooth wireless communication protocol to communicate with any other device that supports Bluetooth (such as a smartphone, tablet, MP3 players or laptop). Depending on the showerhead brand, these wireless speakers are either built into the showerhead or they are small modules that can easily be attached to it. Note that the latter configuration is clearly more practical since you could detach and take the speaker module to practically anywhere. These speaker modules are both water resistant and corrosion proof, and they are designed so that they do not present any danger of electric shock hazard. Once they are paired with a Bluetooth supporting device, they will shower you with music streamed from your favorite personalized playlists. And if you are one of those people who enjoy singing in the shower, now you will be able to sing along with your favorite singers. This article will compare the two most popular wireless speaker showerheads bought by Amazon customers. They are the Kohler Moxie K-9245 and H2oVibe Rain showerheads with Bluetooth wireless speakers. These were not just the most popular at the time this article was written, but they have also received excellent reviews from most Amazon buyers (an average of 4.5 stars each out of 5 stars!). The following table summarizes the main characteristics of the two showerheads. Please read the following table note explanations to understand better the features. Note 2: The Bluetooth protocol supports communications up to 32 ft. Note 3: On both Kohler Moxie and H2oVibe showerheads, the speaker module docks directly into the showerhead and can be easily removed so it can be recharged. The speaker module does not have to be on the showerhead to work and can be used in any other room as long as it's within 32 ft from the music source. Note 4: The speaker module of both showerheads come with a rechargeable lithium ion battery and a USB chord for recharging. Note that the USB cable is provided. You can connect the cable to a smartphone type USB plug or to your computer's USB port for charging. Note 5: With H2oVibe you can answer phone calls on the smartphone. To answer calls, you just need to push the special call-answer button on the speaker module. Note 6: Kohler Moxie K-9245 showerhead comes in 4 colors: polished chrome, oil-rubbed bronze, vibrant brushed nickel and white. H2oVibe comes only in polished chrome. Note 7: All prices indicated above are approximate as they can change any time. Prices also vary with the color chosen. Note that Amazon often provides a good discount on the List Price of sold products. For actual prices, please refer to the Amazon products section below. So, which showerhead to buy? The most important difference is that the H2oVibe unit allows you to answer smartphone calls by simply pressing a button on the speaker module. This feature is not available on the Kohler Moxie. Another difference is the spray surface size which is larger on the H2oVibe Rain showerhead (8" in diameter as opposed to 5" for the Kohler). This difference in size makes the H2oVibe a "Rain" type showerhead. 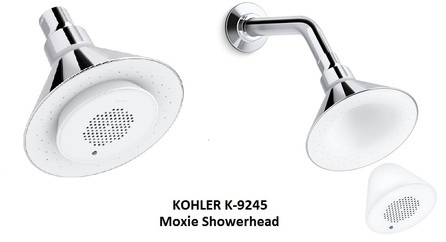 ​Note that Kohler also makes a "Rain" type Moxie showerhead with a larger spray surface (8" in diameter), the Kohler Moxie K-99105. Like the K-9245, the K-99105 is also equipped with a detachable wireless speaker module. One important advantage of both Kohler showerheads (Moxie K-9245 and Moxie K-99105) over H2oVibe Rain is that they come with a limited Lifetime Warranty, while no warranty information can be found in the product description of the H2oVibe Rain showerhead. Finally, Kohler Moxie provides a number of color choices while H2oVibe Rain comes only in polished chrome. Note that installation of both showerheads is very easy: you will just need a pair of pliers or a monkey wrench and some Teflon tape. First unscrew the old shower head. When done, you'll see the shower pipe sticking out of the wall with a threaded end. Use the Teflon tape to wrap around the pipe threads and then simply screw the new showerhead until it's tight. You should use the pliers or monkey wrench to tighten it up. As a final note, these showerheads are the perfect gift for the man or woman who has everything! Please click the showerhead of your choice below for price information or to purchase. Note that the Moxie K-99105 showerhead shown below is the "RAIN" version of the Moxie-9245 with a larger spray surface.